The battle rounds! We are cutting the 48 down to 24 people…these are going to be some brutal cuts, I think. On TEAM ADAM the first match up consists of Tony Lucca Vs. Chris Cauley and they are singing Beautiful Day. Tony is mentored by Alanis…and she is pretty freaking awesome. Chris gets mentored by Robin Thicke, who likes to wear sunglasses inside, apparently. In their performance both of these guys were quite amazing and very comparable. But TONY LUCCA wins the battle. On TEAM BLAKE, his first matchup is Adley Stump vs Raelynn singing Free Fallin’. Raelynn is mentored by Miranda Lambert, who Raelynn was super pumped to meet. Adley gets to be mentored by KC herself! I would be way more pumped to meet Kelly than Miranda (sorry, Miranda). In their performance it seemed that Adley was the much stronger singer, both in pitch and pipes. However, Blake decides that RAELYNN wins the battle. I think she started out very weak, and even though she came around in the end, I don’t think she deserved to win this one. Next up is TEAM XTINA. Chris Mann vs Monique are going to sing the forbidden Celine with the Power of Love. Chris gets mentored by Lionel Ritchie, and Monique gets mentored by Jewel. In their performance, I don’t think they harmonized together too well. Individually, they were both strong, but they felt a little off kilter together. I actually think Monique won the battle in the performance. 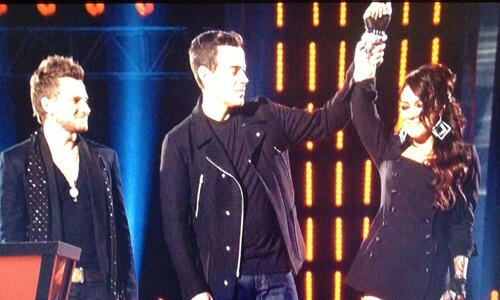 But Xtina takes CHRIS MANN as the winner. For TEAM CEELO, Cheesa is paired with Angie Johnson. They will be singing Total Eclipse of the Heart. In their first rehearsal, they seemed a little petty and competitive with each other. Cheesa has the opportunity to meet with Babyface for her mentoring opportunity, while Angie gets to meet with Ne-Yo. This is a badass battle between these two divas. Angie was more technically accurate on this, but Cheesa had more passion. CeeLo goes with CHEESA as the winner. Back with TEAM BLAKE, it’s Jordis Unga vs. Brian Fuente. They will be singing Ironic by Alanis. So much Alanis tonight! Brad gets to meet with Kelly, who is basically all sorts of awesome. Jordis meets with Miranda, and she is too in her own head. They tell her to stop thinking and just sing. In the performance, these guys did not harmonize well together, either. The key change between verses was awkward. But Jordis definitely wins out on this battle. She was way stronger. And Blake agrees…he chooses JORDIS UNGA. On TEAM XTINA, Anthony is battling Jessie Campbell with Alicia Keys’ If I Ain’t Got You. Jessie gets to rehearse with Lionel Ritchie, and Anthony rehearses with Jewel. They don’t show Anthony meeting Jewel because he probably only knows her from the Intuition razor commercials. This gets the award for the most mismatched contestant/mentor pairing of the evening. As for the performance itself, it was pretty amazing. They definitely saved the best for last. Neither of these guys should go home, because they are both so strong. But Xtina has the tough decision, and she goes with JESSIE CAMPBELL. So we only saw 6 matchups tonight, and there will be a total of 24. Will it really take us 3 more weeks before we reach the live shows? Man this show moves at such a snail’s pace! Even though it is done well, there are way too many contestants on this show. That said, this battle round is rough. It is obvious that two similar (in genre or style) contestants get paired together to preserve the diversity of the team. I don’t know if this is producer-driven or judge-driven. I think it is advantageous to the judge to keep the absolute best contestants regardless of the genre or style, so I assume this is a producer choice. Either way, I am enjoying this show overall, but I am getting impatient to move forward with the whole shebang.